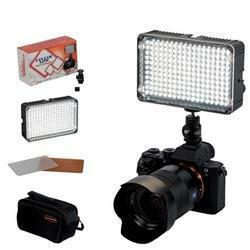 Leading Exporter of led camera light from Mangalore. High-quality Canara LED portable Camera light used as a Key light, Backlight, Fill light, with dimming options for creating many effects for various applications. High CRI 95+ LED with perfect color accuracy. Long-life Light emitting devices, can reach 50,000+ hours. Adjustable color temperature 5600K - 3200K by using of color correcting filter. Light can be operated with multiple battery options either AA or NP-550 battery. Provided universal 1/4 " Metal hot shoe mount. Light weight, compact with expandable up to 9 lights/matrix.